A good twist is one that you could have guessed, but didn’t. This is why so many stories fail in this regard. The perfect twist is predictable without being predictable. It is causal within the mind of the audience, and yet completely unforeseen. But how does anyone go about writing such a thing? And where do they find their ideas in the first place? Twists basically work by subverting an assumption made by the audience. In some cases, this assumption comes from the form of the story. The Sixth Sense, for example, preys on the notion that ghosts look different to normal people on screen, so when Bruce Willis gets shot in one scene, then looks perfectly fine in the next, we presume he survived. The Iron Throne is mine by right. All those that deny that are my foes. The whole realm denies it, from Dorne to the Wall. Old men deny it with their death rattle and unborn children deny it in their mothers’ wombs. No-one wants you for their king. By far the most abundant technique in the series, the argument refers to any instance in which characters ‘show their working’, pointing to evidence that reinforces their beliefs. A classic example of this comes from S02E01, as Tyrion gets reacquainted with Cersei. Both characters are already well-aware of the points Tyrion is making here. However, because he’s using them to justify his newly-appointed position as Hand of the King, they sound like part of an authentic conversation – rather than some clunky recap of Season 1. I should add that this technique is often misunderstood to mean that exposition should be the product of two people fighting – smashing plates and dredging up the past in a bid to score points against one another. It’s more general than that though. Take the scene between Renly and Loras, where Loras is convincing Renly that he would make a good king. Here we have the argument technique in action; Loras is giving evidence to support his argument. However, it clearly isn’t the case that the two of them are having an argument. Everyone already knows about this one, but I might as well mention it anyway. The newcomer works by creating a character with the same level of knowledge as the audience. Thus, when other characters are explaining stuff to her, they’re really explaining stuff to us – but in a manner which is relevant to the story. 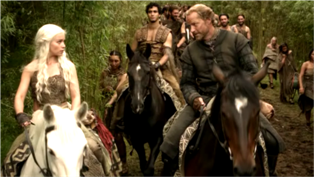 This often comes across as rather lazy storytelling – however, because Daenerys and Jorah are two well-made characters, and because this is just one of a rainbow of expository techniques, GoT definitely gets away with it. Yeah, I know. It happens to everyone. You’re waiting for the final showdown and then that happens. It’s an ending I’ve been thinking about for quite some time now, so here’s my take on it. 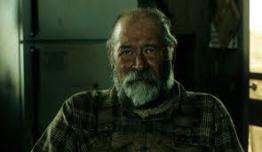 Sheriff Bell’s traditionalist attitude is the main target of criticism in the book and film. It’s parodied slightly in the discussion with the El Paso sheriff, where he laments the rise of “kids with green hair and bones in their noses” and dismantled by Ellis (you know, the cat man), when he describes a similarly brutal murder which took place years and years ago in 1909. Likewise, Wells and Chigurh are both arguably psychopathic killers and yet both address people by “sir” throughout the film, in spite of what Bell says. It’s a pretty obvious theme – but worth bearing in mind when it comes to the death of Llewelyn. See, No Country for Old Men takes its name from the first line of ‘Sailing to Byzantium’ by William Butler Yeats. The poem’s central message is that in order to be happy in old age we should abandon the world’s more primal pleasures and turn to the spiritual and eternal instead. This, then, explains the tonal shift that occurs in the final fifth of the story. Like a person, as the film approaches its end, its focus changes from the external to the internal; the money fades into insignificance. And that’s why Llewelyn dies off-screen. This is the moment when the film reveals that the plot is not important. Nor was it ever, really. Rather than being a cat-and-mouse thriller, No Country for Old Men is a coming-of-age tale in which the real protagonist, Sheriff Bell, comes to understand his place in the universe. I actually think this story has something of a happy ending. When Bell details his final dream, I think it’s the inception of his self-forgiveness. He’s realised the goals he’d set himself were always too great and that, like lighting a fire, you can only produce so much warmth and protection in an otherwise cold and hostile world. Maybe it sounds like I’m trying to hammer hope into a strange, nihilistic ending – but this makes more sense when you consider that Bell was a WWII deserter in the book and never truly forgave himself for leaving his comrades to die, even though he surely would’ve died alongside them. Before Carson Hwells finds out exactly how dangerous Chigurh can be, he is confronted with the question above. The funny thing is, in the context of this scene, Chigurh seems to be mocking Carson’s ability as an assassin. His principles led him to his death, therefore, Chigurh’s methods > Wells’ methods. The penultimate scene shows our antagonist incapacitated by a car crash. 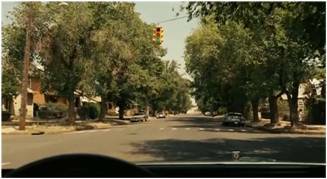 This represents an uncaused event: the traffic light was signalling red and yet – contrary to the rules of the road – the opposing vehicle failed to halt, smashing straight into Chigurh. Could it be, then, that Chigurh’s quote actually relates to the status of the universe? We tend to presume there’s this underlying simplicity to everything – but things may simply not be so. Maybe Occam’s razor is blunt. Maybe the common denominator of the universe is not harmony – but chaos, hostility and murder. There are a lot of similarities between the three main characters of this film. All three men walk back into crime scenes, a lot of the shots are the same, there’s echoes in the dialogue. No two characters really appear in the same shot together (okay, Llewelyn and Chigurh kinda do – but it’s very brief and in the dark.) There’s a kind of ‘three parts of the same person’ thing going on. Llewelyn and Chigurh both suffer gunshot wounds in the same standoff, both get injured in what either is or appears to be a car accident, both hand over money for a shirt to dress their wounds. There’s probably tonnes more. Could this be the directors’ way of showing the underlying reality of the story? Far from Anton being “a ghost” or some kind of contemporary grim reaper, he is just a man like Llewelyn and Ed Tom? People always describe Chigurh as a form of unstoppable evil, however, I think they ignore the fact that this story may be coming from the memory of Sheriff Bell – and may therefore be coloured by his feelings towards it. 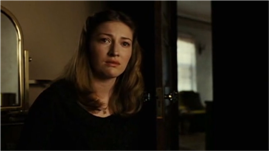 The final confrontation between Chigurh and Carla Jean seems like a fairly straight analogy for the dilemma of determinism: either CJ must accept her fate and be killed, which is no kind of choice at all, or she must resign to the randomness of the coin toss, in which case she still has no control over her outcome. However, unlike the Texaco man, Carla Jean refuses to comply. I think this is an important aspect of the story. Many philosophers believe that the key to our freedom is our ability to do things for a reason, rather than some confusing ability to do otherwise. So, this could be seen as an intellectual defeat for Chigurh. Carla Jean chooses to die rather than play by Chigurh’s rules, demonstrating that she is free in ways that he is not. No Country hints at notions like conservatism, nihilism, free will, morality but never says anything definitive. Maybe this is the point of the story. That, although it seems to be discussing something particularly profound, it is actually ‘a tale told by an idiot’ – a jumbled mess of happenings that cause you to look for a kind of depth which, on greater inspection, simply isn’t there. In other words, part of the nihilism of the piece is that you can’t say anything principled about it. Anton Chigurh, the Salamanca Twins, the Joker make up some of the most evil villains in years – so why do people like them so much?